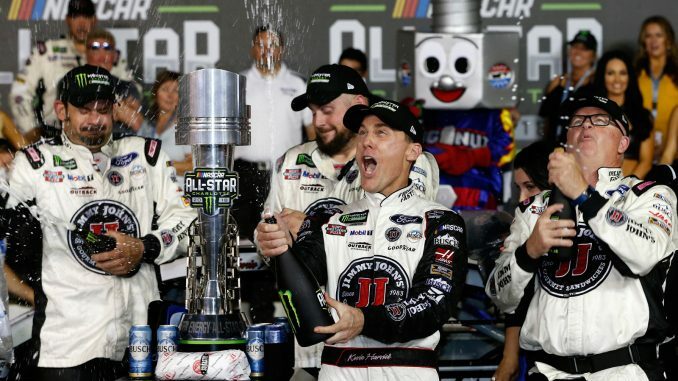 CONCORD, N.C. – Kevin Harvick’s answer to NASCAR’s new competition package was the same old song—another victory in a season that already has produced a surfeit of success. 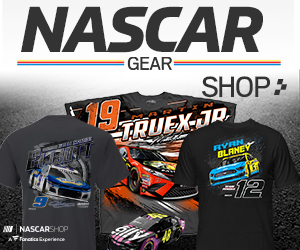 This time it was Saturday night’s Monster Energy NASCAR All-Star Race at Charlotte Motor Speedway, with a restrictor-plate limiting the horsepower and a large blade on the rear of the cars providing downforce and maneuverability. Harvick’s No. 4 Stewart-Haas Racing Ford was still the strongest car in the field, and the driver who already has five points wins this season added another in the marquee exhibition race, taking control of the event with an overtime surge at the end of the 20-lap third stage and sealing the victory by outrunning Daniel Suarez in the final two-lap drag race to the finish. With lane choice on the final restart, Harvick picked the top lane in front of eventual third-place finisher Joey Logano. The choice paid off, as Logano gave the No. 4 Stewart-Haas Racing Ford a strong push off the second corner, allowing Harvick to clear the No. 19 Toyota on the backstretch. The third-stage victory also proved critical. In the second attempt at overtime, Harvick passed Kyle Larson for the top spot and held on to win the stage. That gave him lane choice for the final stage, and he never relinquished the lead. Harvick picked up his second victory in the All-Star Race, the first won coming in 2007. The winner of the previous two Cup points races, at Dover and Kansas, Harvick didn’t earn championship points for his victory at Charlotte, but he did claim the $1-million prize that goes to the winner. Leading every lap of the final 10-lap segment of the scheduled 80-lap event, Harvick crossed the finish line .325 seconds ahead of Suarez, who came close to clearing Harvick off the second corner after the final restart but didn’t have enough room to slide up in front of the No. 4. A six-car wreck that started near the apex of Turns 3 and 4 on Lap 75—during the first attempt at overtime at the end of Stage 3—eliminated the strong cars of Martin Truex Jr. and Brad Keselowski, both of whom led laps in the event. Fans got their first look at the new competition package in the Monster Energy Open, which produced scintillating racing and multiple lead changes in each of the three stages. Race winner Allmendinger advanced to the main event, along with Stage 1 winner Alex Bowman and Stage 2 winner Suarez, who fell one spot short of the rare feat of winning the All-Star Race after transferring from the Open. Notes: Harvick led the final 25 laps of the first stage. All told, he led 36 of the 93 laps (with the race extended 13 laps by the Stage 3 overtimes)… Kyle Busch led the final 19 laps of Stage 2 as the only driver other than Harvick to take a checkered flag on Saturday… Harvick’s pit crew climbed the frontstretch catch fence en masse after the victory… Truex led three times for 17 laps before being wiped out in the Lap 75 wreck. 1. (4) Kevin Harvick, Ford, 93. 2. (19) Daniel Suarez, Toyota, 93. 3. (10) Joey Logano, Ford, 93. 4. (14) Denny Hamlin, Toyota, 93. 5. (21) Chase Elliott, Chevrolet, 93. 6. (11) Jimmie Johnson, Chevrolet, 93. 7. (16) Kyle Larson, Chevrolet, 93. 8. (20) AJ Allmendinger, Chevrolet, 93. 9. (7) Kyle Busch, Toyota, 93. 10. (17) Kasey Kahne, Chevrolet, 93. 11. (2) Ricky Stenhouse Jr., Ford, 93. 12. (9) Austin Dillon, Chevrolet, 93. 13. (12) Jamie McMurray, Chevrolet, 93. 14. (1) Matt Kenseth, Ford, 93. 15. (6) Ryan Blaney, Ford, 93. 16. (13) Ryan Newman, Chevrolet, 93. 17. (5) Martin Truex Jr., Toyota, Accident, 75. 18. (15) Kurt Busch, Ford, Accident, 74. 19. (3) Clint Bowyer, Ford, Accident, 74. 20. (8) Brad Keselowski, Ford, Accident, 74. 21. (18) Alex Bowman, Chevrolet, Accident, 68.